Any Amazon seller worth their salt will tell you that winning the Buy Box is one of the most important things you can do to boost your sales. But what exactly is the ‘Buy Box’? It’s a term thrown around with little or no explanation as to what it is exactly, or why anyone should care about it. However, if you’ve used Amazon to buy anything in the last five years or so (and let’s face it, you most likely have), you’ll have probably already seen the Buy Box, even if you don’t have a label for it. And once you understand it, you can begin to leverage its magical powers to bolster your business with those much-needed extra sales. The Buy Box is simply the box that appears at the right-hand side of the product page. The Buy Box selects the ideal seller from the ‘New’ category (where applicable), selecting the winner based on a number of factors. The two most important factors though are pricing and availability. Amazon will always endeavour to get the cheapest seller with stock into the Buy Box to enhance customer experience all-round. Why does the Buy Box matter? The Buy Box matters because it’s a crucial way in which you stand out from competing sellers. The vast majority of buyers will click the “add to basket” link in the Buy Box when looking at an item because — let’s face it — why would you want to waste precious time scouring the depths of the ‘New & Used’ section at the bottom of the product page if Amazon automatically pulls out the best product for you? Therefore, ‘winning’ the Buy Box (that is, being selected as the seller for the ‘add to basket’ button) is a major boon to your shop, because it’ll vastly increase the volume of your sales. So, what is it you can do to ensure that you’re at the top of the pile? If you want to be a successful Amazon seller, you need to be reliable. That’s a requirement, not a preference. Customers always take a greater risk shopping online than in-store, especially when the seller is a third-party, unaffiliated with Amazon on a corporate level. So how does Amazon measure your reliability? There are a few metrics you’ll want to keep your eye on to ensure that your maintaining a good seller status. You can find these in your Seller Central dashboard by going to Your Account > Your Seller Account > Performance. 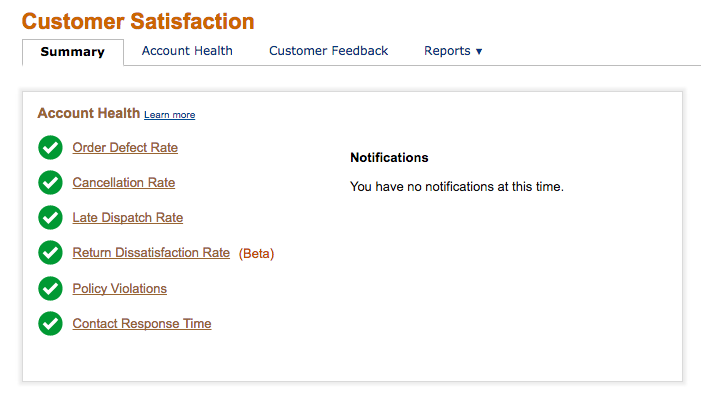 On the right of this Seller Central page, you’ll see your customer feedback statistics. This shows you how many positive, neutral, and negative reviews you’ve had. These are divided into different time spans, from 30 days to lifetime. That way, you can measure the impact of changes to your approach to customer satisfaction, and use that data to optimise your rate of positive feedback over time. Order Defect Rate — This is the percentage of orders than received some form of negative feedback, had an A-to-Z claim filed against it or a service credit card chargeback. This is the metric by which Amazon measures your account’s overall performance, so it’s really important you keep it low. Cancellation Rate — This measures your in-stock rate for items sold with Amazon. When your out of stock, order get cancelled, which provides a negative experience for your customers. Late Dispatch Rate — This measures the rate of orders that are confirmed to be dispatched three or more days beyond the expected dispatch date. Return Dissatisfaction Rate — This measures the rate of valid return requests that were not answered within 48 hours, were incorrectly rejected, or received negative customer feedback. You can choose to automatically authorise returns to keep the Return Dissatisfaction Rate low if you can afford it. Policy violations — This reports on any selling policies you might have violated in your time as a seller. Contact Response Time — This measures the rate at which you respond to customer queries within 24 hours. Hit all of Amazon’s targets, and you’ll stand a strong chance of winning the Buy Box. Offering the lowest price is instrumental in winning the Buy Box, for the simple reason that (coming as no surprise to anyone) competitive pricing is the most important store feature for buyers. 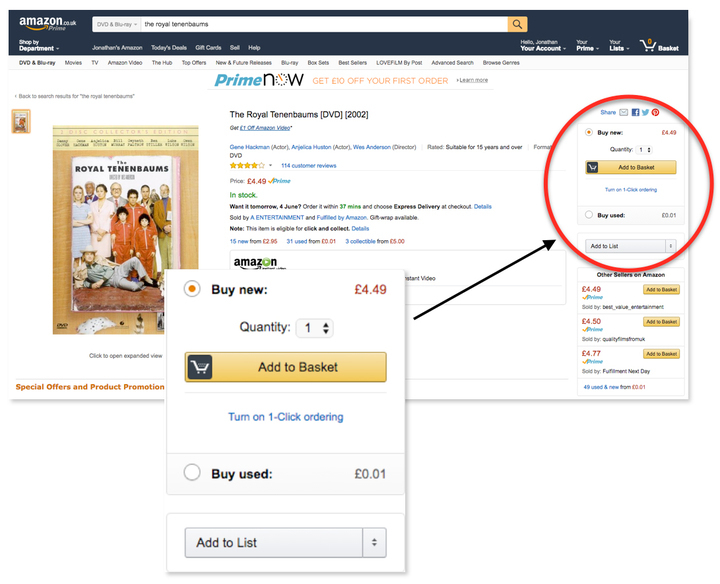 That’s precisely why Amazon puts a high value on pricing in it’s Buy Box algorithm. Check out who currently tops the Buy Box. Take note of the price of their product, including shipping. Break down your own pricing into: cost, shipping, selling fees (that is, the commission that Amazon takes on your product) and margin. If you can undercut the price of the Buy Box winner without going into negative margin, consider changing your price. In the event that undercutting your competitor wins you the Buy Box, the influx of new customers will likely outweigh the loss of margin from the drop in average order value. Plus, you should consider halo benefit of having your seller name in the Buy Box. Customers are more likely check out your profile and find other items you’re selling if they have a good shopping experience with you. Remember: If you absolutely cannot undercut the Buy Box winner, you can still beat them if your seller rating is better than theirs, so ensure that remains your primary focus. If your inventory is empty, you can’t sell your wares. That might sound pretty basic, but you’d be surprised at the number of sellers who get caught out by a rapid increase in sales, brought in by the Buy Box, wiping out their inventory before they have the chance to replenish it. That puts them back to the bottom of the pile, because it counts as bad customer experience. Therefore, you’ll need to keep a close eye on your inventory if you want not only to win but also to retain the Buy Box spot. You can see your current inventory by going to your Amazon Seller dashboard, and selecting the ‘INVENTORY’ tab in the top left corner of the screen. Amazon encourages sellers to offer a number of shipping options for everything they sell to make things more convenient for the customer. It’s a contributing factor in whether or not you win the Buy Box, so take heed. Next-day delivery — Once a luxury, next-day delivery is now the industry standard. Perfect for catching excited buyers. Economy delivery — For patient, frugal buyers. International delivery — The ‘global village’ means the e-commerce is not limited by the national borders. Offering international shipping allows you to attract overseas customers and drive more sales. Of course, the best thing you can do to boost your sales is offer free shipping. Not only will Amazon favour you for doing so, but it’s proven to be influential in a customer’s buying decisions — the second-biggest factor, in fact. If you’ve played your cards right, you could see your display name up there in the Buy Box, and a healthy influx of new customers. Winning the Buy Box takes competitive pricing, a lasting inventory, and plenty of shipping options — but most importantly of all, it requires a reputation for great customer experience. If you want to reap the rewards of reaching the Buy Box, therefore, everything you do should be in the interest of the customer. Simple! Got any other tips? Leave a comment below!